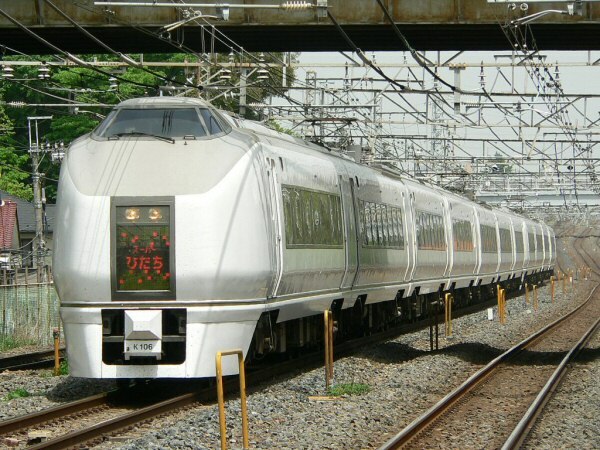 The 651 Series was the first of a new generation of limited expresses built for JR East. It was revolutionary in its design and set a new standard for trains of its type. Unlike limited express trains built by the Japanese National Railways (JNR), the 651 Series was built for one line and one line only. Thus, it is equipped to run almost entirely on the Joban Line and to appeal to riders in that area. The outer design is a drastic change from the 485 Series trains that ran as the Hitachi. The design itself is said to be a modernized version of the "bonnet trains" but its white paint scheme and LED panel on the front symbolized JR East as the new name in rail in eastern Japan. Though the 651 Series was impressive in the late 80's and early 90's, it has began to show some its age and is scheduled to be replaced in regular service by the E657 Series in Oct. 2012. At the time of its introduction, the paint scheme and body design were referred to as the "Tuxedo Body."